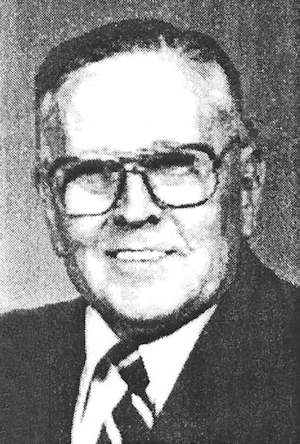 Obituary – Dykes, John Henry « Perry High School Alumni Association, Inc.
John H. Dykes, 83, long-time Perryan, died at 11:15 a.m. Monday, March 24, 1997, at Perry Memorial hospital. Funeral was at 2 p.m. Wednesday at the First Presbyterian church. Rev. Cortez Cranfill officiated. Burial was in Grace Hill cemetery under direction of Brown Funeral home. Dykes was the son of John O. and Mollie (Farrer) Dykes. He was born in Grant county, Oklahoma on July 12, 1913. He was a graduate of Perry high school. On Nov. 23, 1941, he and Lillie Schlosser were married at Perry. A member of the United States Army during World War II, Dykes served with the 188th Medical Corps in England and played with the 45th band. He worked as a mechanic and had been employed at the Oldsmobile garage and Randall Motor Company in Perry for a number of years. He retired from the Oklahoma Highway Department. Dykes was a member of the First Presbyterian church. In addition to his wife, of the home, survivors include a daughter and son-in-law, Debris and James Henderson, Perry; a granddaughter, Mrs. Mark (Sherry) Marston, Perry; three grandsons, Bryan Henderson, El Reno, Randy Henderson, Morrison, and Matthew Henderson, Perry; and four great-grandchildren, Jared, Brianna and Michaela Marston, Perry, and Jacob Henderson, El Reno.